She then wants to hear from you about your experiences in engineering education and careers. Please RSVP below to join in the experience at Reds Alehouse! SWE New Year, New You! 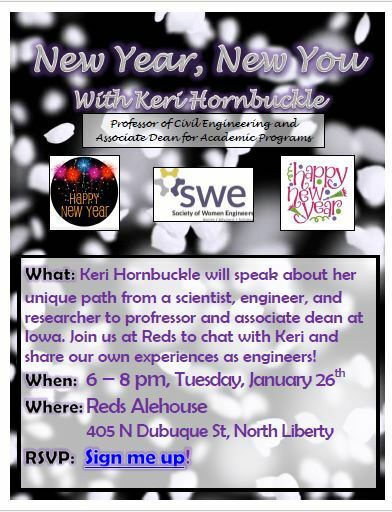 Keri Hornbuckle is the Donald E Bently Professor of Engineering and Associate Dean for Academic Programs in the College of Engineering at The University of Iowa. She is a former Department Chair of Civil & Environmental Engineering and serves on the faculty of CEE, as well as the Interdisciplinary Graduate Program in Human Toxicology. Her research addresses the sources, transport, and fate of persistent organic pollutants, including both legacy and emerging pollutants. Her lab conducts large-scale field and modeling projects in urban, industrial, and rural environments, much of which have focused on the Great Lakes region. Hornbuckle is a past President of the International Association for Great Lakes Research and is Associate Editor of the journal Environmental Science & Technology. She is an alumni of the ELATE program - Executive Leadership in Academic Technology and Engineering - a program at Drexel University designed for women leaders. 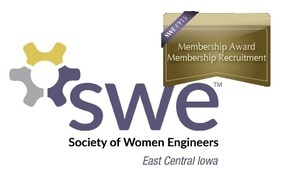 She was awarded an early CAREER development award from NSF, The University of Iowa Distinguished Achievement Award for women faculty, and the College of Engineering Distinguished Research Award.